Dear Volunteers, if u are not on any of the parts of the programme, u can approach Kenneth/Aini for a more detailed explanation. A more detailed plan will be sent to ur email once we finalise all details of the following activities. Note: Tell the children the week before that we will be making the finger puppets so that they know they must come. Make extra puppets for the 2nd week, for the children who didn't come the week before. Collect and keep the finger puppets in the 1st week so that the children won't forget to bring. Go through the roles and actions for the the children's dramatisation section. 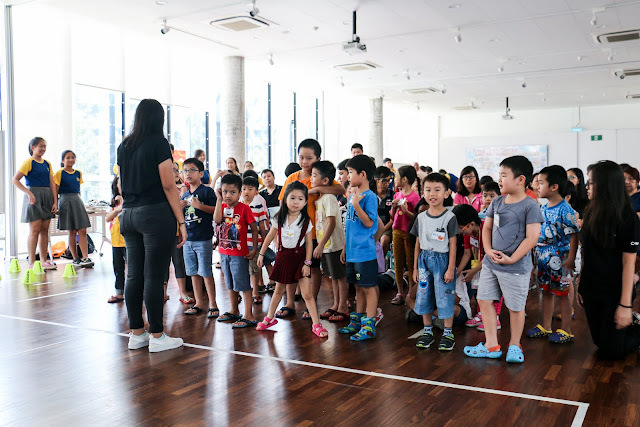 If the volunteers in-charge want more buffer time to give the children more time to learn the roles and actions, they can cancel out the small book reading. Use the same story dramatised by the volunteers in the 1st week. Split the children into different groups so that it's easier for them to learn. They will then later perform in the same groups. Dramatisation by the children: volunteers may want to invite the parents to come in and watch. Hot seat: a volunteer will be on the hot seat and the children will be the ones that ask the questions since they are naturally more curious. Puzzle games: enlarged pictures of dinosaurs are cut up and later the children will have to work together to solve it. like a jigsaw puzzle. Frozen pictures: we will ask the children to move around the space given and act as dinosaurs. a volunteer will then say stop and everyone freezes. volunteers may want to take pictures when they are frozen. The details will be sent to everyone when ready. If you have any questions, please ask either Foong Chuan or myself. - Includes intro song and some songs to tune children in. Made it 10 minutes so as to factor in late comers. - Read the Big book two times. - First time for discussion and second time for fluency. Should take 15 minutes actually since it is a short book but have included 5 minutes buffer time. Should be enough provided everything runs smoothly. - Show children flash cards of sports and briefly explain them. - This does not have to take up to 15 minutes actually, in fact can probably finish between 10 to 15 minutes. - Playing of Simon Says/Magic rocks, where children do actions of the various sports. Requires volunteers to role model. Do not play this game if there is no time left. - Includes goodbye song, getting the children to wear their shoes and queue up for snacks. - Read small books related to the theme. It is crucial at this point that volunteers show children that books are a good place to further their interest in sports and can also bring out the joy of sports, so as to ensure that the love of reading can be complemented with the interest in sports we are cultivating through the activities. - Recap the big book ice cream stick. Check for understanding at this point and ensure that children can remember the sports in the book. - Play Simon Says/Magic rocks. However, if this game was played during previous week and volunteers think children have already enjoyed it last week, we could play another game where children get to try out the sport (in mini version), so we could probably play bowling with a paper ball and plastic bottles or maybe play soccer (penalty shoot out style) with mini goal posts and balls. Hopefully these sports are easy for the children to pick up if they are interested. Perhaps it can also drive them to reading books about them. a. A mouse made up of a foam cup and having ears made of sticks, eyes drawn in and whiskers and ears made of paper. b. A few ice cream sticks, to complement the book. c. Tennis ball for the part where the mouse plays tennis. e. A mini skateboard, which can be a toy one or one made of an ice cream stick and marker caps. Required for the part where the mouse skateboards. 3. Getting of volunteers to bring items of sports (e.g. tennis racket, soccer ball) one week before start of theme, as children remember what they see the most. 4. Making of mini sized sports equipment if volunteers are thinking of letting the children try out mini versions of the sports.